The Haunted Woods was a place of contradictions. Strange magic drifted through the trees, casting illusions and fogging the line between waking and dreams. To live in such a place required an acceptance that things were not always what they seemed. However, the people of the Woods could always count on three constants that would never change. One: real Werelupes always had red eyes. Two: solving anagrams could be hazardous to your health. And three: Quintus McDooglie was completely insane. He was, in fact, more than merely insane. He was crazy, mad, batty, cracked, demented, loony, off his rocker, missing his marbles, one Tchea shy of a Lost Desert fruit salad, and at least two Poogle Biscuits short of a complete tea service. McDooglie was a Krawk, though the term applied loosely as he was so old he resembled a Meridellian scarecrokabek with a back so stooped he was half the height of his youth. His left eye was concealed under copious wrinkles, while the right eye bulged unnaturally, so that if he turned towards you at the right angle you could swear he was sizing you up for a new recipe. Neovia was McDooglie's chief haunt, though no one knew where he really lived. He would simply show up, tottering along with his tattered cloak and top hat, leaning heavily on his cane and muttering about spooks and curses and lands made of jelly. Endless stories followed in his wake, many of them concocted and embellished by the children of the town. It was on a cool day in early spring that one such child encountered Quintus McDooglie as she played tag through the streets with her friends. “Why do I always have to be 'it' first?” Tennyson whined. Tennyson grumbled but accepted his fate as he always did. Six children had gathered for the game that morning, and as usual it was Lillabeth who was ordering everyone about. Lillabeth was eight-years-old, a Xweetok who sported Faerie coloring. Such a pattern was uncommon for a Neovian, but there had been a number of such random bits of magic after Faerieland crashed. Lil, as she was known in short, was rather proud of her new shade and the wings that allowed her to hover and fly for short distances. Though she was the youngest of her group of friends – Tennyson, a blue Aisha, being the oldest at eleven – Lil had a knack for seizing everyone's attention and distributing orders. None of the older kids liked to admit it, but she was often seen as their impromptu leader. Instantly the children scattered across Neovia's central square, darting down side streets and dodging passerby. Tennyson chose to follow his younger brother Lucas first, and so Lil was afforded an opportunity to look for a hiding place. She veered down an alleyway where some of the more unusual shops were located. Lil knew that Tesla Mae, her big sister and guardian, would disapprove, but the alley was usually clear of pedestrians and full of old crates and boxes, making it the perfect place to hide and wait for the opportunity to sneak past her friends and get to home base. She'd win the game for certain. Lil was so sure of her plan that she didn't notice the obstacle that rose out of nowhere and blocked her path until she collided with it and fell back on her posterior right into a puddle on the cobbles. Scrambling to her feet without a thought for her soaked dress (except that Tesla would be very cross), Lil looked up at the figure before her and her eyes grew round as marbles. The old Krawk harrumphed and turned to aim his bulging eye at the little girl. Mr. McDooglie was certainly cranky, even crankier than Tesla Mae when Slorgs got into her garden, but there was something in his voice that made Lil hesitate to do exactly what he suggested. Everyone warned her to stay away from the crazy old fellow, but they'd never said that he was so . . . sad. “I'm not going to run away,” Lil replied simply. McDooglie cocked his brow dubiously. “Don't you think I'm scary?” he asked. McDooglie's smile vanished at once. It was like a veil had dropped over his face and he scowled meanly. McDooglie turned and shuffled off down the alley, leaving Lil confused as to what she'd done wrong. She almost followed the old Krawk to find out, but Tennyson and the others began calling her, reminding her that they were playing tag, not hide-and-seek. So, with one last look back at McDooglie, Lil ran to join her friends. The children played well into the afternoon. Before they knew it the sun was dipped low and it was time to go home for dinner. The other children lived in town, but Lil lived with her sister in a cottage near the edge where Neovia's farmlands became wild forest, a place where Tesla had plenty of room to grow the herbs she made into medicines and teas. Many times Lil had walked home on her own. She wasn't scared of the Woods and its secrets, but tonight was a full moon. All sorts of things would be roaming, and Lil hurried faster than usual to make it before Kreludor rose above the hills. It was quiet and misty. Lil had almost made it when she heard a twig snap in the trees off to her left, followed by a low, throaty growl. “Little morsel, so innocent and so alone,” the whisper came from the forest, sounding so close Lil could have sworn it was right behind her. Most Neopets would freeze in terror at such an ominous sign, but Lil had grown up in the Haunted Woods and she knew that once people started using words like “morsel” it was time to run. She wasted no time and took off down the road towards her house as fast as she could go. Unfortunately, she didn't get very far. A figure leaped out of the forest and landed on the dirt path before her. Bathed in the light of the moon just as it crept over the horizon, the figure was revealed, and Lil shrieked in terror. She's never actually seen a Werelupe before, but decided at once that the stories did them no justice. They were far more frightening than her friends had ever claimed, all muscle, shaggy fur and bright red eyes. Lil didn't like being bossed around, especially in such a condescending tone, and it was the bit of indignation at the Werelupe's orders that helped her break the paralysis of fear and bolt into the trees. She ran for all she was worth, hoping that the branches would slow the Werelupe down. They did, but only a little, and Lil was followed by crashing and snarling that drew closer and closer. Determined to escape, Lil didn't notice the rock outcropping until she was trapped, cornered against three large boulders. The Werelupe found her in moments and laughed cruelly as he advanced. “I don't think you've won just yet, laddie,” said a cracked old voice that came out of nowhere. Startled, the Werelupe stumbled to a halt and turned to the intruder. 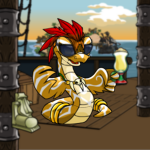 Out of the shadows, into the moonlit clearing, came the last Neopet Lil would ever have expected to see: Quintus McDooglie. Lil had been watching this exchange with a dizzying mixture of hope, fear and confusion. She thought she couldn't be more surprised, but was quite wrong. Mr. McDooglie threw down his battered cane and pointed his palms towards the ground. At once a strange wind began to whip through the clearing, circling and gyrating like a tornado. The Werelupe was looking less than confident now, but he had faced all manner of sorcerers before and refused to be defeated by a wrinkled and bent old Krawk like this. With a threatening growl he hunkered down and sprang for Mr. McDooglie. The old Krawk moved quicker than Lil could track. He soared into the air on the cushion of his winds and jumped over the Werelupe, who went crashing into a nearby log in his confusion. Once safely in the middle of the clearing, McDooglie made a series of gestures and spun the winds into a whirling mass of air. The Werelupe was scooped up like a leaf and carried away, sailing across the trees in the middle of the funnel cloud until his howls were only distant echoes against the hills. McDooglie lowered his arms and the winds died down. Then he pulled his cane back into his hands with the help of a friendly breeze and snorted contemptuously. Turning around, McDooglie faced Lil and grinned. “Are you all right then, lass?” he asked. Lil's mouth was hanging wide open. She had forgotten all about the terror of becoming a 'tender morsel' and grinned gleefully in return. “Why aren't you anymore?” Lil wanted to know. 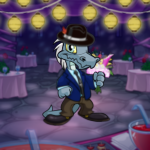 Lil felt her heart swell with affection towards this strange old Neopet who had such a bad reputation among the people of the Woods. She didn't want him to be sad, and so she did what no one had done to Quintus McDooglie in many years: she threw her arms around his neck and hugged him tight. McDooglie was not given to shows of emotion. He never had been, even back in his glory days as Captain Gusto: Master of the Winds. But he felt a little tear work its way down his snout, a tear that he quickly brushed away when Lil released him and stepped back. Lil smiled at her new friend. She hugged her hero again, and this time Mr. McDooglie hugged her back. And taking the crazy old Krawk by the hand, Lil walked out of the forest with him and all the way to where her sister was waiting with supper on the table. Some days later, Lil was in town with her sister Tesla Mae, a young Eyrie with Plush-colored plumage, delivering medicinal concoctions to the physician and the dentist, when the two encountered Mr. McDooglie. “Yes, Tessie,” Lil replied obediently. But she looked back at Quintus McDooglie and offered him a smile. In return the Krawk put a finger to his lips to seal their secret and winked. The prince was supposed to have come long ago, but she didn't really care. "This isn't right," she muttered, standing up. "This was too easy..."
Juri is a useless pet.